Jamalabad fort, located 8 km north of Beltangadi town, which is 65 km from Mangalore, is 1788 ft above sea level and was formerly called Narasimha Gudde (Narasimha Hill), which refers to the granite hill on which the fort is built. It is also referred locally as 'Jamalagadda'. The fort was built by Tippu Sultan in 1794 and named after his mother, Jamalabee. The fort is said to have been built over the ruins of an older structure. 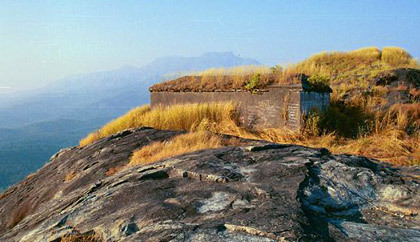 The fort is inaccessible other than via a narrow path, with nearly 1876 steps to the fort that are cut out of this granite hill and lead all the way to the top through the fort to the summit. This would mean that a small but well armed group could indefinitely block a much larger force from entering the fort. Inside the citadel there is only one tank to store their water. There is a remain of a single cannon on the hillock. Nothing much of the fort is remaining but hints of the fort wall and parapets. There is also a unmanned microwave repeater station on top of the hill. These days, Jamalabad is a trekking destination, with the climb up to the fort being classified as 'medium difficulty level' and the top of the fort offers good views of the surrounding landscape and the Kudremukh range. There is a forest check post at the base of the hill where visitors have to pay a nominal entry fee. Visitors should carry plenty of water since there is no potable fresh water available on top. The nearest town with any communication and medical facilities is Belthangady (Beltangadi). Officially entry to the fort is restricted to between 6 am to 6 pm . Overnight stay at the fort is prohibited. The hillock has only one room on top of it. It is not tourist attraction but is a good destination for enthusiastic trekkers.